Love is Everywhere: Yorkie Splash & Shine Giveaway! 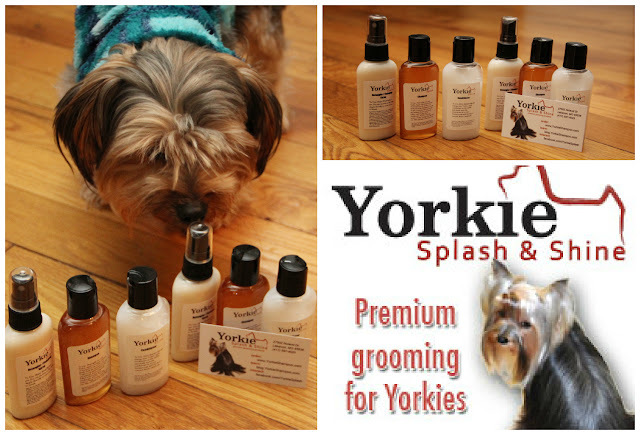 Yorkie Splash & Shine Giveaway! Peanut LOVES Yorkie Shine & Splash and believe me when I say it's changed his life. A small puppy like him that has the most sensitive skin is now stress free each day after using these products. I recommend these lovely chemical free products if you have a Yorkie or know someone who does! You can read about Peanut's story here: Peanut's Splash Time with Yorkie Splash! To enter this awesome Giveaway you'll follow the options below. You must like Yorkie Splash & Shine Facebook Page as well Love is Everywhere to enter. The rest are all extra fun entries to help your chances to win! Prizes: There are TWO sets of Yorkie Splash & Shine samples which includes Yorkie Splash Shampoo, Yorkie Shine Conditioner, and Yorkie Sheen Detangler/Conditioner Spray! So that means there will be TWO winners! Woohoo! Good luck and have fun!